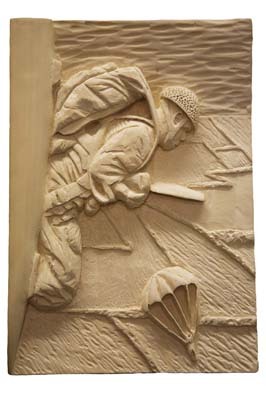 "Paratroopers played an important part in the Second World War. Germany was the first to see their potential, using them to effect in their attacks on the Netherlands and Crete. Before 1940 neither Britain nor America had parachute regiments. In June 1940, Prime Minister Churchill demanded a corps of at least 5,000 parachute troops and by the end of 1940, the British 1st Airborne Division was formed. Allied paratroops were used in 1944 on D-Day and at Arnhem but they suffered very heavy casualties. Most commanders recognised the value of airborne troops to seize strategic sites and hold them until ground troops arrived. However, despite achieving elite status, doubts about their effectiveness were raised." January/February 2000, and issue 101 March/April 2008). 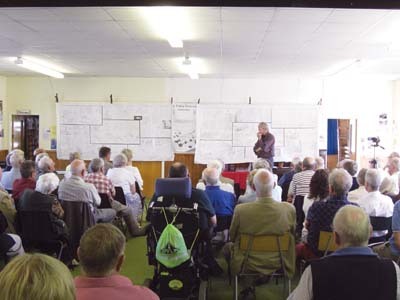 Following the success and wide acclaim of a panel produced by the club commemorating the 25th anniversary of Overgate Hospice in Elland Calderdale, 2007, in which local scenes and activities were depicted, it was proposed at a club meeting in early 2008, that the membership undertake a similar, but more demanding, project. 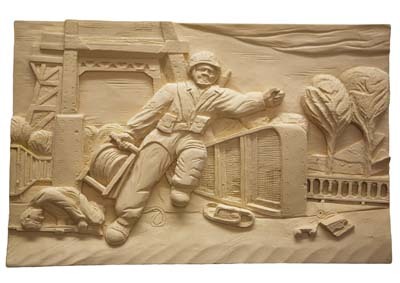 The subject matter this time would be scenes from the First and Second World Wars, the intention being to show, in a series of individual carvings, the horror, suffering, courage and human spirit of those who took part in these conflicts. 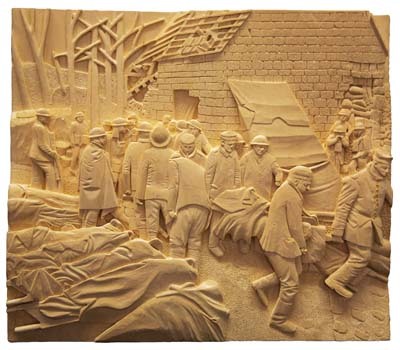 Initially, only one large panel was envisaged but when 54 carvers showed a willingness to be involved, it was quickly decided that we could produce two panels, commemorating each conflict. 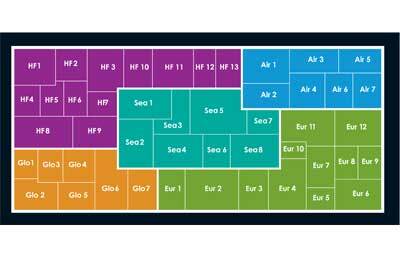 On each panel, five 'themed areas' were planned as shown in the two diagrams in the gallery (images 3 and 4) - Air (blue), Sea (teal), Europe (green, Home Front (purple) and Rest of the World (orange). 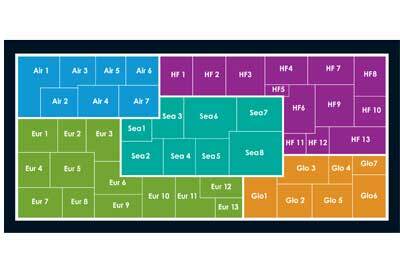 Each area would identify and separate the main conflict zones associated with each of the World Wars. On the finished panels, these areas would be clearly defined by a larger spacing between them and the eventual 95 individual carvings. A sub-group of the membership was formed from volunteers to collect suitable photographs and pictures representative of the five selected themed areas, and to plan the overall dimensions and layout of the two panels. It was agreed that the overall size of each panel would be 3.048 x 1.524m (10 x 5ft), including a 100mm (4in) wide utile (Entandrophragma utile) hardwood frame. As with previous panels, the timber forcarving would be lime (Tilia spp). Our aim was to cover as many sectors as possible of the armed forces and civilian population which played a part in both conflicts, such as the Bevin Boys, the Land Army Girls, Fire Fighters and animals used in war, along with the frontline fighting forces. 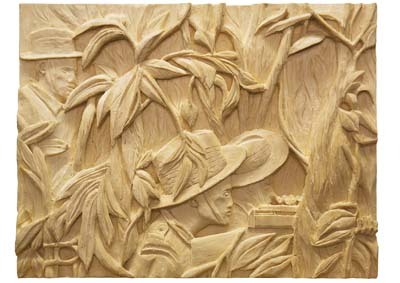 Eventually, 95 pictures of various sizes were selected, which would involve varying levels of skill and difficulty in carving. Because suitable photographs from the 1914/18 period were both scarce in variety and very dark in colour, a small group of very good artists amongst our members set about re-drawing all 95 pictures into line drawings to assist with the perspective and actual carving. These drawings were photocopied and resized to specific dimensions to fit into their allotted place in a full-size paper plan of each panel. 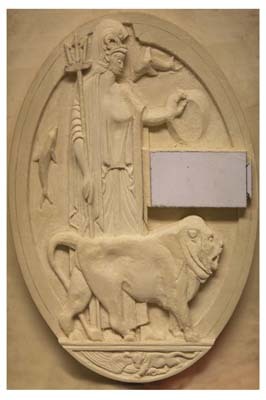 The Royal Armouries Museum, Leeds was chosen for the final location of the two panels. As the Museum is Britain's oldest and has one of the greatest and most comprehensive collections of arms and armour in the world it was, therefore, a perfect match to the military theme of our project. 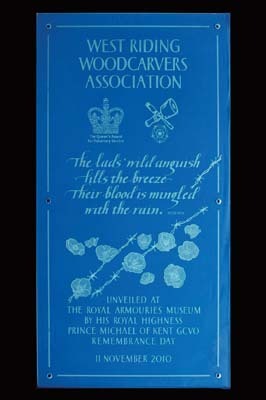 Plus with the museum located in West Yorkshire where all our members reside, the panels would be easily accessible. 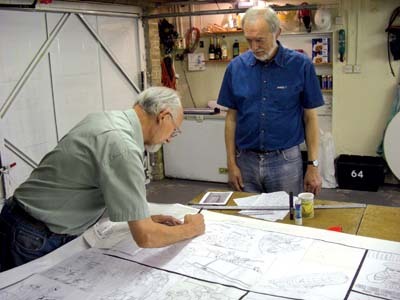 On approaching the Royal Armouries, armed with a full-scale paper plan of each panel and samples of relief carvings done by club members, they were delighted to immediately enter into a joint partnership with the club. Our club charges an annual subscription of Â£20 and it has never been our intention to accumulate funds beyond our general running costs, but to seek grants for any charitable project we undertake. On this occasion, we approached the Leeds Community Foundation for financial assistance with material costs. We were offered a very generous sum to cover nearly all materials, administration and publication costs, and we are extremely grateful to the Foundation for their encouragement and support throughout the project. We returned to a supplier with whom we have a close relationship - Hexhamshire Hardwoods in Northumberland. They supplied 95 individual 32mm (1 1/4in) thick, machined lime wood pieces to the sizes we requested. 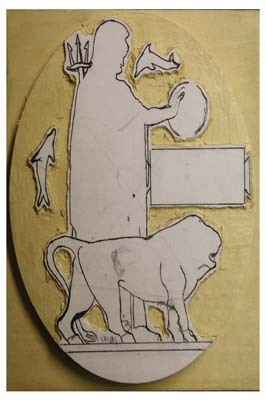 Our members were issued with instructions encouraging them to carve deep to create shadow, but to leave 14mm (3/8in) of background to ensure that the carving could be screwed from the back onto an MDF backboard. 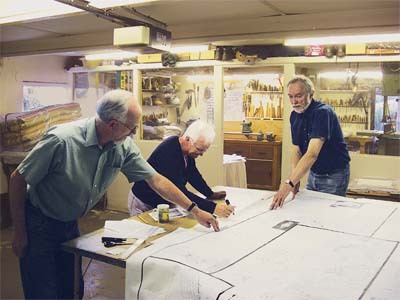 The volunteer carvers were given three photocopies of their particular picture and a block of lime wood, both to the exact size dictated by the master paper plan of each panel. A set of brief instructions was issued regarding the depth of carving, keeping fine detail away from edges in case the size of the carvings had to be altered slightly on completion, and the need to not bleach or use any form of stain. to an admirably high standard. One of the overriding reasons for undertaking this project was to bring club members together so that everybody, irrespective of skill, could become involved in. 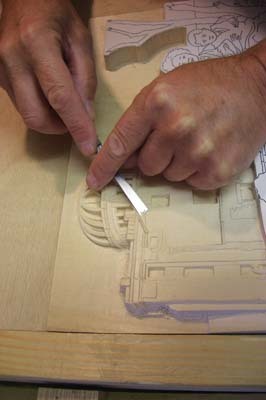 Everyone was encouraged to keep a check of the hours they put into the carving process. 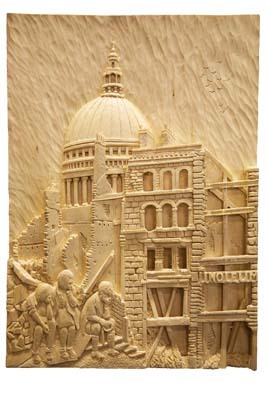 As a conservative estimate, we are sure that just over 8,000 hours of carving in total went into the completed panels. 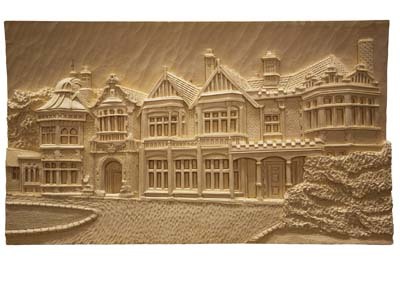 Once completed, each carving was dipped for protection in a clear sealant and brushed over with a proprietary woodworm killer solution, so as not to introduce woodworm into the priceless exhibits within the museum. Many hours were put into the machining, sanding, polishing and construction of the two custom-made frames by two of our long serving members, and the individual carvings were precisely mounted onto a 19mm (3/4in) MDF backboard. The construction was such that the frames and backboard holding the individual carvings could be separated for transportation. A wooden cover to encompass both frame and panels was made to protect both. Every November the Royal Armouries undertakes a month-long 'Reflect and Remember' project that cumulates in a special Service of Remembrance, attended by local dignitaries, children and adult choirs, trumpeters and WWII veterans on Remembrance Day. During the two-minute silence, poppies descend from the upper galleries onto the heads of those gathered for the service. It was agreed that this occasion would be the perfect setting for officially unveiling the panels in their permanent home. 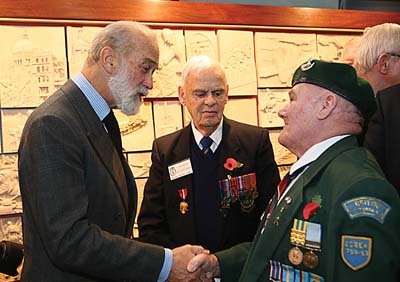 We were honoured that HRH Prince Michael of Kent, accompanied by Dr Ingrid Roscoe, Lord Lieutenant of West Yorkshire, agreed to unveil the panels. The day of the 11 November 2010 was a lovely occasion, with over 130 of our club members, family and guests attending. After a suitable introductory speech by a Director of the Royal Armouries, Prince Michael unveiled the panels and took great delight in meeting and talking to many of those present. 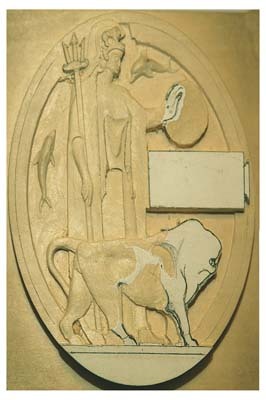 1 December, the carved panels, glass sheet, video information and carving details were moved to their permanent location on the 3rd floor at the entrance to the 'War Gallery'. 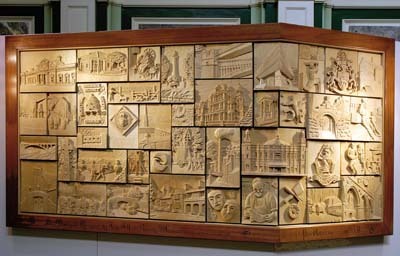 The many wonderful comments expressed about the panels, the generosity of people who wouldn't accept change from £5 or £10 notes for a booklet, and generally just talking to the very interesting, warm and lovely people who took time to view the carvings, was truly humbling for our members. Their comments, and the funds we raised for the Children's Hospice, fully justified the many hours the club had spent undertaking this project. "Tethered observation balloons, usually manned by a crew of two, were a common sight in the First World War. As they floated above the trenches, their crews sent important reports of enemy troop deployments and artillery positions back to the ground by flag signals, or even radio messages. If approaching enemy aircraft were spotted, the ground crew quickly winched down the balloon and its crew escaped. The enemy sometimes tried setting the balloons alight using incendiary bullets. 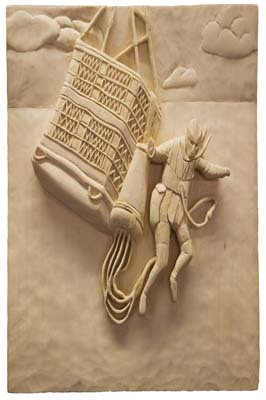 If this occurred then, despite having parachutes, it was often difficult for the balloon's observers to get down safely." "Salvation Army officers, including women, served in France in various non-combatant roles during WWI. The women were affectionately known as the Doughnut Girls thanks largely to the doughnuts they served to the soldiers. 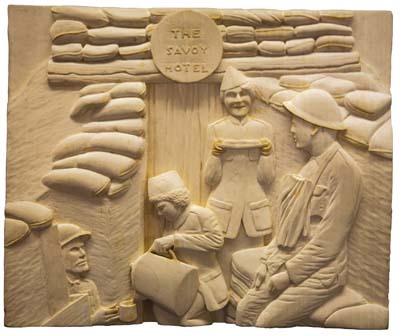 The carving depicts Salvation Army doughnut girls and a sign bearing the name The Savoy Hotel outside a dugout - showing the troops' ironic trench humour." "On 22 April 1915, the German Army started its gas campaign against the Franco-British Ypres sector of the Western Front by letting off 6,000 cylinders of chlorine gas, badly affecting the men's breathing and causing casualties. This led to the use of phosgene gas, a compound of chlorine and carbon monoxide, and then to the introduction of mustard gas in July 1917. Mustard gas was very toxic if inhaled, caused severe blistering of the skin and often resulted in blindness. 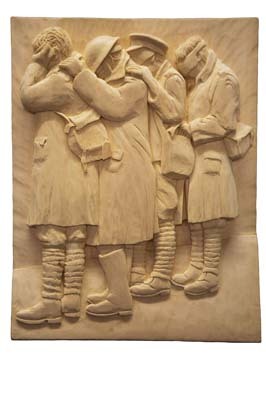 This carving shows gassed soldiers covering their eyes with bandages soaked in water as a temporary relief from pain." "This scene at Ovillers on the Somme in July 1916 shows a British rifleman on guard against a surprise attack from the enemy, whilst his companions in the trench take the opportunity to catch up on their sleep. They are occupying a well-constructed trench captured from the Germans. A 'fire-step' was built so that soldiers could step up, observe the enemy and fire from their trench. Here the original step is on the left but the trench has been reversed. An emergency fire-step was hacked out of what had been the rear of the German trench so that it now faced the other way." 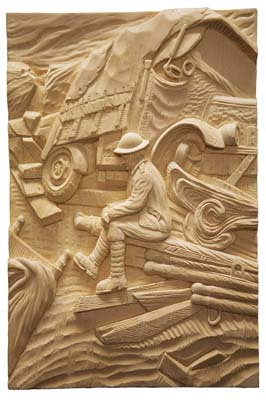 "This carving is from a photograph taken on 19 October 1914 showing the Menin Road between Ypres and Menin in Belgium. The British had recaptured Ypres from the Germans on 18 October and planned to push on to Menin. However, General Rawlinson hesitated, having learned that German reinforcements had reached Menin, and the advance halted. The Menin Road was one of the most dangerous areas within the Ypres Salient, which jutted into enemy territory, The German Army occupied higher ground on the north, east and south of the town, and their artillery had a clear view for shelling their targets with deadly accuracy." "HMS Amphion was the first British warship to be lost in the First World War. On 5 August 1914, Amphion helped to destroy the German minelayer Konigin Luise as it dropped mines overboard, but the following morning, Amphion struck two of the mines and quickly sank. With the war only 32 hours old, HMS Amphion, which had helped to inflict the first German naval loss, became herself the first British naval casualty." 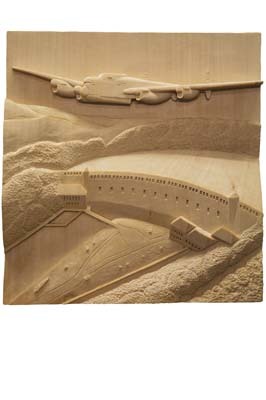 "This carving combines an Avro Lancaster bomber and the undamaged Eder dam. On 16 May 1943, Wing Commander Guy Gibson VC led a raid by 617 Squadron intended to breach the Mohne, Eder and Sorpe dams in the heavily industrialised Ruhr Valley of Germany. Special cylindrical bombs designed by Barnes Wallis - a genius who also did woodcarving - were used. When released at a precise speed and height, they skipped across the surface of the water and rolled down to explode, causing shock waves to damage the dam. Two were weakened, causing floods that disrupted industry, destroyed railways, road bridges, hydroelectric power stations and caused heavy casualties." "Private Helmut Romer was on night sentry duty at Benouville (later 'Pegasus') Bridge over the Caen Canal. Suddenly, an aircraft swooped out of the sky to the north. It was a British Airspeed Horse glider carrying 25 troops, and it was followed by two more. As Romer dived for safety, British paratroopers leapt from the gliders. Within minutes, they captured the bridge. Other airborne troops seized a bridge over the Orne River. The bridge's capture by a single glider-borne company of the British 6th Airborne Division a few hours before the D-Day landings on 6 June 1944, secured the Normandy invasion's eastern flank." 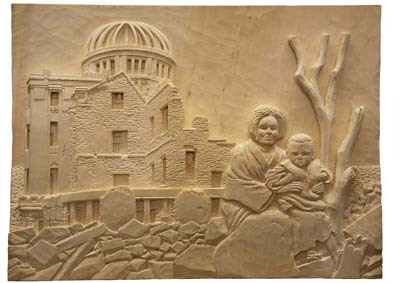 "This carving was made from two photographs - one taken in Hiroshima soon after the bombing showing survivors of the first atomic bomb, and the other showing the present Hiroshima Peace Memorial. On 6 August 1945, the first atomic bomb detonated almost directly above what is now the Hiroshima Peace Memorial causing blast, fire and radiation. The Memorial is one of the few buildings to have survived the bomb and it forms part of the Peace Memorial Park, now a world heritage site. 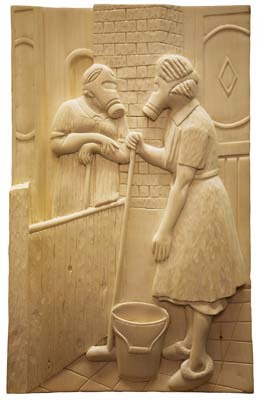 This carving attempts to show that in war it is always the civilian population that suffers most." "Renowned for their ferocity and bravery in battle, Nepalese Gurkha soldiers have been an integral part of the British Army for almost two centuries. They still carry their traditional weapon - an 18in long, curved knife known as a kukri. In the Second World War they fought in North Africa and Italy but are more famous for their part in the Burma campaign. Some of the Gurkhas operated behind Japanese lines as part of the Chindits - a special force formed by Orde Wingate to stop the Japanese army threatening India. 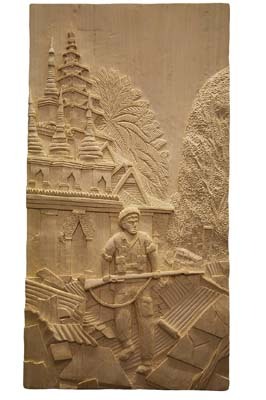 This carving shows Gurkhas waiting in ambush for a Japanese patrol in Arakan, western Burma." "The horrors of the First World War with the use of poison gas in the trenches, had convinced the British government that the enemy might use gas against civilians, even though both sides had signed up to the Geneva Convention which prohibited it. By September 1939, 38 million gas masks had been issued to families - adult masks were black, children's were red and blue, and babies' masks had a bellows for adults to pump air in. However, poison gas was not used and by early 1940, many people were so blase about the threat, that they ceased to carry their gas masks." St Paul's Cathedral and of children bombed from their homes. The second 'Great Fire of London' occurred on 29/30 December 1940 after a two-hour attack by the Luftwaffe. Incendiary bombs set alight a large area of the City of London. Buildings damaged included eight Wren churches, the Guildhall, Law Courts and Tower of London. One incendiary penetrated the lead of St Paul's dome and burned, however, the bomb fell outwards into the Stone Gallery and was quickly extinguished, so St Paul's was saved." From the outset, our aim was to raise funds for the new Forget-me-Not Childrens Hospice, serving the people of Kirklees and Calderdale through the sale of commemorative booklets, featuring a foldout cover front and back. 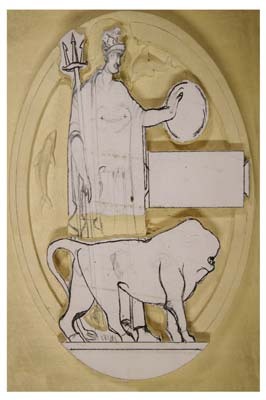 The inner of the foldout cover shows a diagrammatical representation and key to individual carvings, together with photographs of the completed panels. 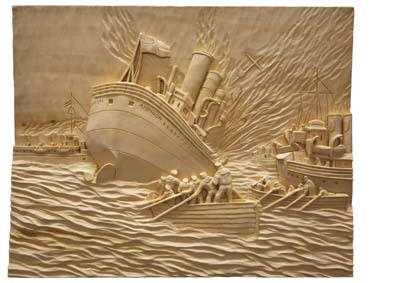 Each carving, photographed by one of our members, Graham Lockwood, is accompanied by detailed and interesting information regarding the subject matter, sourced by the carvers themselves. With the proceeds of the Leeds Community Foundation grant, and the assistance of the Royal Armouries on design and printing, 3,000 booklets were produced to a very high quality. Help with financing the printing of the booklets resulted in us being able to sell them at the relatively modest price of £4 each, with all the funds eventually being passed to the Childrens Hospice. 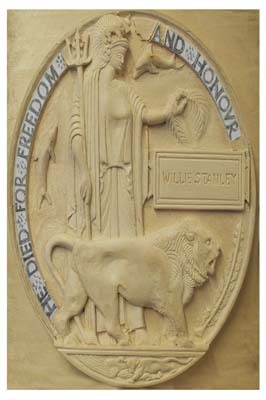 To order one of the commemorative booklets, contact John Murphy on 01422 361109 or visit the West Riding Woodcarvers Association website. Booklets are £5 including p&p and goes towards the Forget Me Not Trust, set up to raise funds to build and run a childrens respite centre and hospice in West Yorkshire. Alternatively, you can make a donation online at the Forget Me Not website. OR send a cheque to The West Yorkshire Forget Me Not Trust, 14b Longbow Close, Pennine Business Park, Bradley, Huddersfield HD2 1GQ. 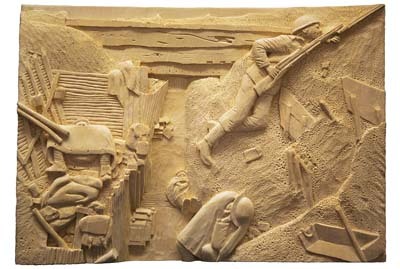 You can see for yourself these amazing World War panels at the Royal Armouries, Leeds - find them on permanent display on the 3rd floor to the entrance of the War Gallery.